Michigan said all of the right things since its loss to Xavier and even jumped out to an early lead on Wednesday night against UConn. The Wolverines were hustling, grabbing four offensive rebounds in the first five minutes of play, but they weren’t shooting. That was enough to grow a modest lead, but not much more. The hustle plays eventually wore out, but the shots never started falling. Michigan said all of the right things since its loss to Xavier and even jumped out to an early lead on Wednesday night against UConn. The Wolverines were hustling, grabbing four offensive rebounds in the first five minutes of play, but they weren’t shooting. That was enough to grow a modest lead, but not much more. The hustle plays eventually wore out, but the shots never started falling. After a Derrick Walton three gave Michigan a 12-5 lead with 14:30 to play, the Wolverines made just 2 of their next 19 shots and found themselves down 41-24 with under 18 minutes to play in the second half. Caris LeVert played another terrific game, finishing with 21 points on 7 of 12 (2 of 4 3-point) shooting, but he sat on the bench for the final eight minutes of the first half after picking up his second foul — he finished with two fouls in 27 minutes. When he was on or off the floor, LeVert didn’t have much help. 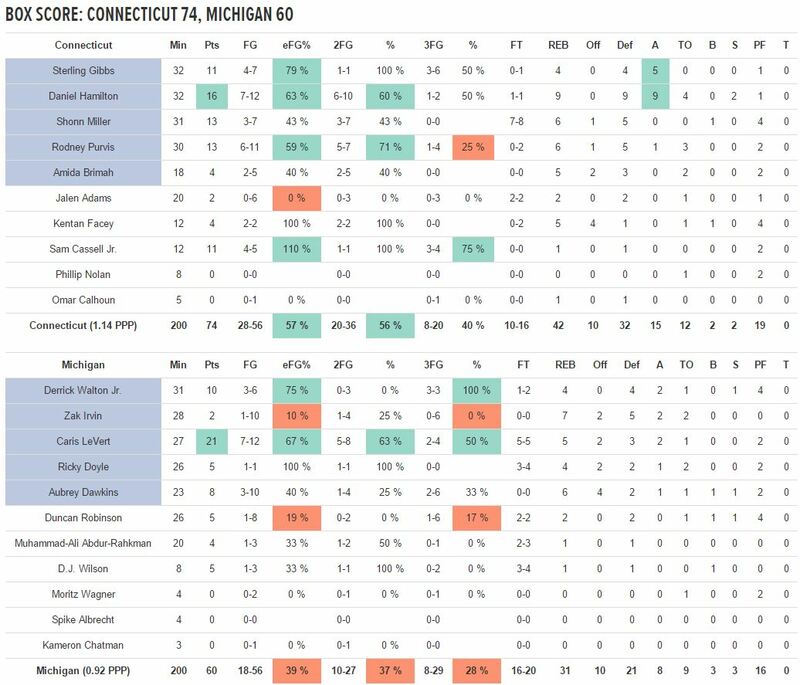 Michigan’s designated shooters — Zak Irvin, Duncan Robinson and Aubrey Dawkins — were a combined 5 of 28 from the floor. Michigan’s .92 points per trip of offensive production were boosted by a late comeback effort. For the first three-quarters of the game, that number was hovering closer to .8 points per possession. Michigan doesn’t have a team constructed to win games under a point per possession and is just 3-17 when it fails to reach that mark over the last three seasons. That’s an unenviable distinction that the Wolverines recorded twice as many times last season as the two previous years. This offense isn’t working. The confidence wasn’t there as shooters seemed to pass up good shots and force bad shots. Duncan Robinson was pump faking and dribbling into charges instead of shooting when he was open and Zak Irvin’s jumper continued to be missing in action as he returns from his back injury. The list goes on. 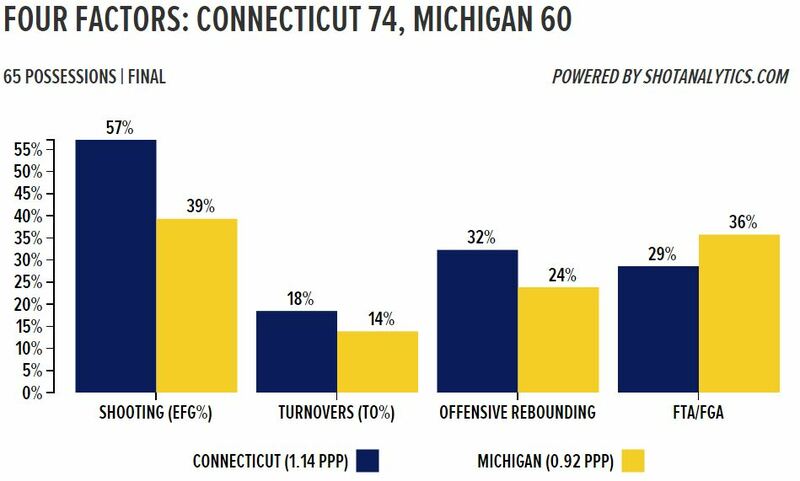 The Wolverines continued to fire up long jumpers and couldn’t create any offense near the basket against UConn’s length. There are no easy baskets and there’s only one player on the team who can consistently create for himself or anyone else. UConn hit threes, but most importantly it got to the rim. 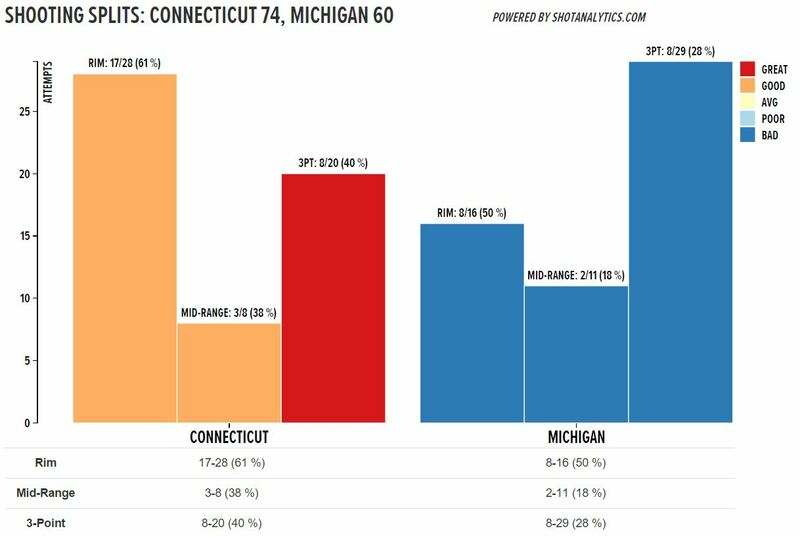 The Huskies were 17 of 28 at the basket compared to Michigan’s 8 of 16. The Wolverines were just 10 of 27 on two-point attempts for the night and attempted over half of their field goals from three-point range. Daniel Hamilton and Sam Cassell Jr. were the difference makers for UConn. Hamilton flirted with a triple double, hitting a number of clutch shots in the first and second half, while Cassell buried three triples on four attempts. There was no real secret to the Huskies’ success offensively, they simply got better shots and made more of them. UConn is a good team, the second team in a row that Michigan has played that looks good enough to compete for its conference title, but people expected this Wolverine team to be a good team also. Good teams have to figure out a way to beat other good teams sooner than later. Michigan is facing a crisis of confidence with the offense sputtering, the defense lacking and its record sitting at 2-2. The Wolverines won’t have any time to shake it off as they’ll be back on the floor against Charlotte on Thursday night at 9:30 p.m. (AXSTV). On paper, the 49ers look like the perfect opponent for a team that needs to find a confidence boost. They are just 1-3 with losses to Elon, ECU and Syracuse, but Michigan won’t soon forget the loss against Charlotte in Puerto Rico two years ago. Caris LeVert: LeVert is a big time shot maker Offensively, LeVert continued to excel. He made his twos (5-8) and his threes (2-4) and hit an array of big shots that kept the game somewhat close in the second half. His defense wasn’t great as he struggled to keep Rodney Purvis out of the lane, but he’s the only player on Michigan’s offense that has found any consistency over these first four games. Derrick Walton: Walton hit three triples late, but struggled to create for the first portion of the game. He played 31 minutes, but sat for a pretty lengthy stretch of the second half when Beilein went with Abdur-Rahkman at the point guard. Walton had just two assists, but was the only other Wolverine to reach double-figures. Zak Irvin: Irvin’s jumper isn’t close to going in. His shot doesn’t look good out of his hand and he’s hitting everything other than net. He’s 3 of 8 on twos and 1 of 13 on threes since he returned against Elon, but he did grab seven boards in 28 minutes. Aubrey Dawkins: Dawkins hit an early triple, but still finished 3 of 10 from the floor. His off the dribble game was a struggle and his long range stroke isn’t consistent either. He grabbed six rebounds on the night, but had his third underwhelming showing is as many tries. Ricky Doyle: Doyle got the start and had a dunk off of a LeVert drop off, but he dropped another pair of drop off passes that should have been dunks. He finished with 5 points, four rebounds and an assist in 26 minutes. Moritz Wagner: Wagner moved up to the second big man off the bench, but was 0 of 2 from the floor with two fouls and a three second violation in four minutes of game time. Duncan Robinson: Shooters gotta shoot and Robinson stopped shooting by the end of the game. He’s in the game to make threes, but he was just 1 of 8 from the floor and started to force things off the bounce when he missed a couple early treys. Spike Albrecht: Beilein said after the game that the staff is focusing on a heavier load of rehab for Albrecht because he’s not in the physical condition that Michigan needs from him at this point. He played just four minutes, but did create a turnover getting on the floor for a jump ball. DJ Wilson: Wilson had a two handed dunk off of a drop off pass and also a nice block as a help-side defender, but overall his night was fairly limited. 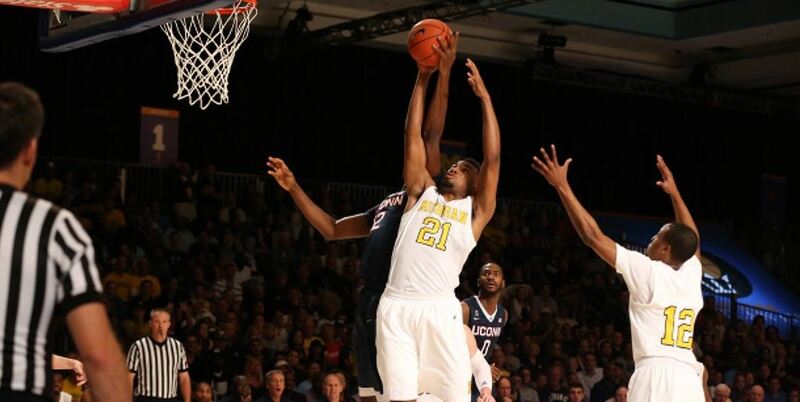 Beilein complimented his third big man for knocking down 3 of 4 free throws on the night. Muhammad-Ali Abdur-Rahkman: 20 minutes was a high water mark for Abdur-Rahkman this season and he scored 4 points. His lone field goal was a nice driving take to the rim, but his night was otherwise pretty quiet.